The one behind the Grossmünster [Big Cathedral], in the crossing with the Kirchgasse. You might remember from previous posts, Felix, Regula and Exuperantius, the patron saints of Zürich. They were decapitated close to fountain number 106, miraculously stood on their feet, picked up their own heads, walked forty steps uphill, probably passed by fountain number129 before finally dropping dead on the floor. They were buried on the spot where they lay down, on the hilltop, probably not far from this fountain. Legend says that Charlemagne got lost during a hunting expedition while pursuing a stag. At the graves of Regula and Felix, his horse kneeled down in deference to the saint martyrs and refused to carry on. To honour the saints, Charlemagne, decided to found a church, which would later become the Grossmünster. 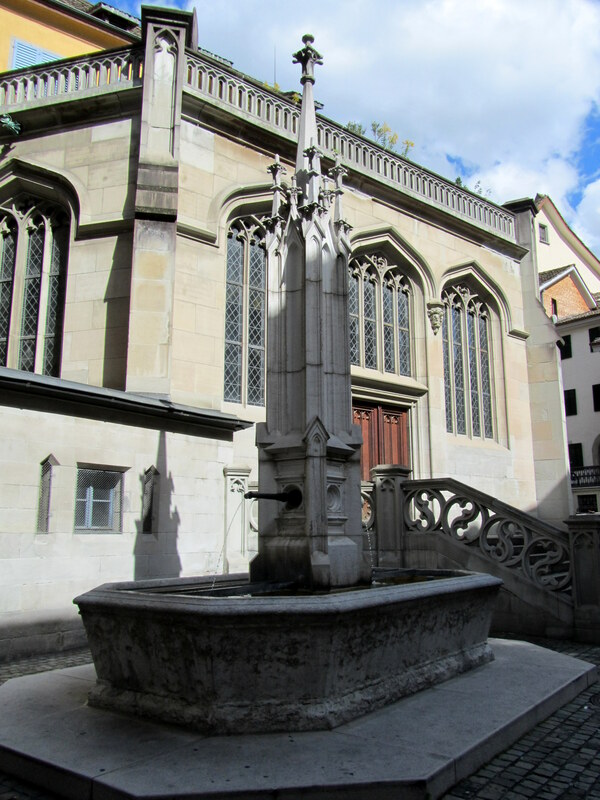 While the fountain may pass unnoticed – it is at the back of the building – the cathedral’s twin towers are the most recognizable landmarks in modern Zürich. Note: This snapshot was taken a couple of Summers back. If you venture around the Grossmünster right now, all you will find is a lot of construction work.